Whether you’re a novice to motorcycle riding or an experienced biker, you know that riding a motorcycle leaves you more vulnerable on the road than does riding in a passenger vehicle. The instability of two wheels and lack of car walls are part of the risk, but many riders would argue that the real dangers are the conditions outside of the bike or the rider’s control. 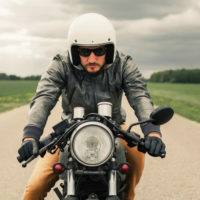 If you’re a motorcyclist in Idaho, read on to learn more about what every good rider should know, and contact a knowledgeable Boise motorcycle accident lawyer if you’re hurt in a crash. 1. Helmets have been shown to save lives. In Idaho, motorcyclists aren’t required to wear a helmet while they ride unless they’re a passenger or driver under age 18. That said, wearing a helmet can save your life. Studies show that helmets are 67% effective in preventing head injuries to riders. Since the number one cause of death among motorcyclists is head injuries, riders are well advised to wear a helmet even if it isn’t required. 2. Safety classes are available, and can save you money. The Idaho STAR, or Skills Training Advantage for Riders program, offers state-run training courses for motorcycle riders throughout the state. The STAR program offers introductory and basic courses for new or intermediate riders, as well as courses for experienced bikers, along with braking and cornering clinics and precision riding courses. Not only can riders learn how to drive defensively on Idaho roads in these classes; they may also be eligible for a discount on their insurance by successfully completing a STAR class. 3. Motorcyclists are more likely to be involved in a solo crash than other drivers. According to the National Highway Traffic Safety Administration (NHTSA), 41% of all fatal motorcycle crashes were single-vehicle accidents. Motorcycles are more likely to be forced off the road than other drivers due to their lower stability as compared to four-wheel vehicles and greater susceptibility to dangerous roadway and weather conditions. If a negligently-maintained road or dangerous driver is the cause of the solo crash, riders may still have a legal claim against the responsible parties. If you or someone you love has been injured in a motorcycle accident in Idaho, find out if you’re entitled to file a legal claim based on your injuries by contacting the knowledgeable and seasoned Twin Falls personal injury attorneys at Pedersen & Whitehead for a free consultation, at 208-734-2552, with additional offices located in Boise at 208-336-2552.